KENNEBUNKPORT, Maine — Jeb Bush, who has a longtime relationship with this seaside town where generations of Bushes have vacationed, is having a house built for him at the family compound on Walker’s Point, with a wraparound porch and expansive views of the Atlantic Ocean. The home, on a 1.3-acre site assessed by the town at $1.4 million, was initiated for him by his mother and father, who have tried to preserve the family ties to the picturesque property. But as he tries to appeal to middle-class Americans in his likely Republican presidential campaign — and distinguish himself as his own man, distinct from the legacies of his father and brother — having a vacation home erected on a spit of land in coastal Maine could be a vivid reminder of the complications facing his campaign. Already, his opponents are emphasizing his last name — and the old-money New England clan that helped build the Republican Party establishment — as a way to highlight a brand that has fallen out of favor with the newly empowered, anti-elite activists who may have an outsized voice in choosing the next Republican nominee. 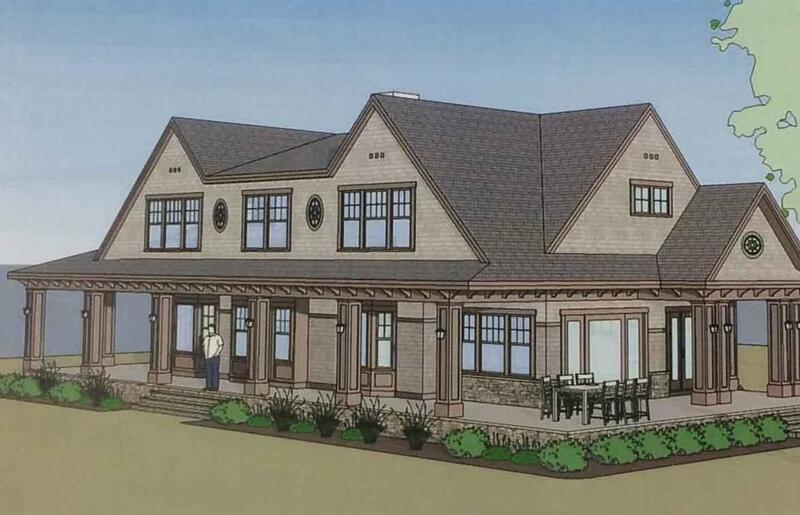 At 3,000 square feet, the four-bedroom, four-and-a-half bathroom home, with shingle siding and gabled roof, will be the second-largest home at the compound when completed in July. The construction cost of the house, referred to as a cottage in planning documents, is estimated at $600,000. Kennebunkport for decades has offered a respite for Jeb Bush, a place where he retreats for early morning rounds on the golf course, intensely competitive games of horseshoes, and jaunts to local stores and lobster houses. The former Florida governor has had limited input on the design and construction of the new house, according to those involved. Much of that was done by his mother. A rendering of Jeb Bush’s home in Kennebunkport, Me. The wives of Jeb Bush’s two sons are helping pick some of the interior options, such as tiles, light fixtures, paint colors, and the kitchen layout. An aide to Jeb Bush said his parents wanted to ensure all of their children had homes on the property, and Jeb’s four siblings already have homes set aside for them on the compound. The aide said the new house was being built using a limited partnership that owns the other homes on Walker’s Point; Jeb Bush is not a partner and doesn’t have any ownership stake in it, the aide said. 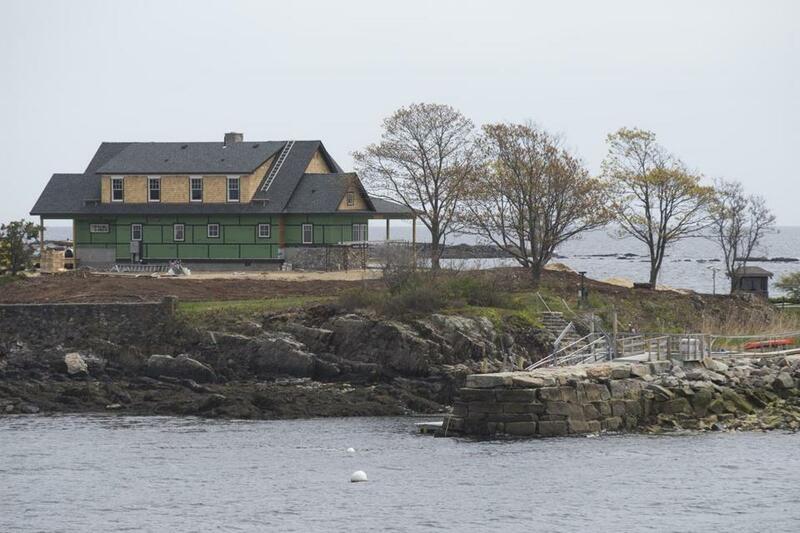 The “Jeb Bush House,’’ as it is referred to in renderings on file with the town planning office, is being completed amid a cluster of eight buildings on Walker’s Point, which has been in family hands for more than a century. The largest house is a six-bedroom, 7,100-square foot home built in 1920. The others have been added over the years. The property also contains a building for Secret Service agents, a gym, a tennis court, and several guard shacks. 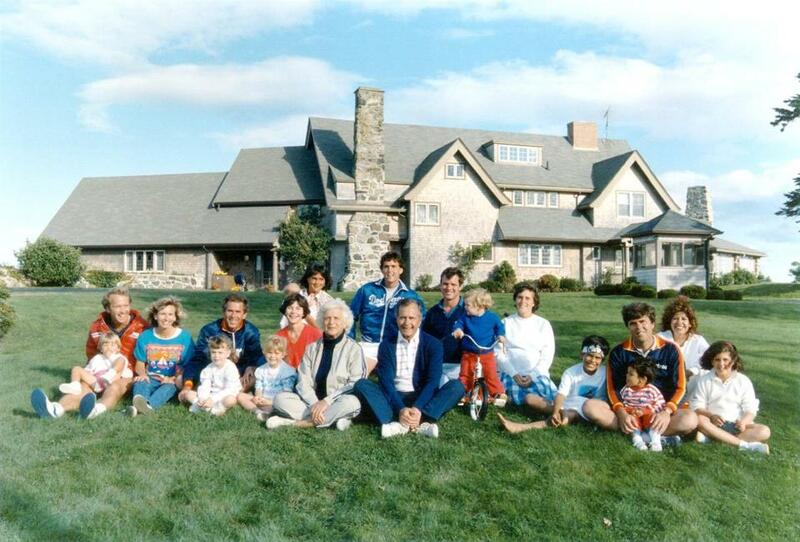 A portrait of the family taken in 1986 in front of the main house of the Bush compound. The new house will be highly visible when guests arrive for Barbara Bush’s 90th birthday in two weeks. There are plans for a big two-day celebration, with events to raise money for literacy causes dear to Barbara Bush. Jeb Bush and his sister Doro are cochairing the event, which has raised more than $10 million and will also be attended by former President George W. Bush. Local residents speak of the Bushes like extended members of their own family, and say the Bushes treat them that way, too. Most stores and restaurants in town proudly display framed photographs of the family on their walls, although locals say Jeb Bush has kept a far lower profile than other family members. But Jeb Bush arrives in Kennebunkport almost every summer for an extended stay, usually showing up for the first tee time at 6:30 a.m. at Cape Arundel Golf Club. Like his father, Jeb Bush is an unusually speedy player, often finishing an 18-round game within two and a half hours. “His day for golf has ended before most people have thought about breakfast,” Raynor said. Like his father, Jeb Bush is an unusually speedy golf player. Pictured: George W. Bush, George H.W. 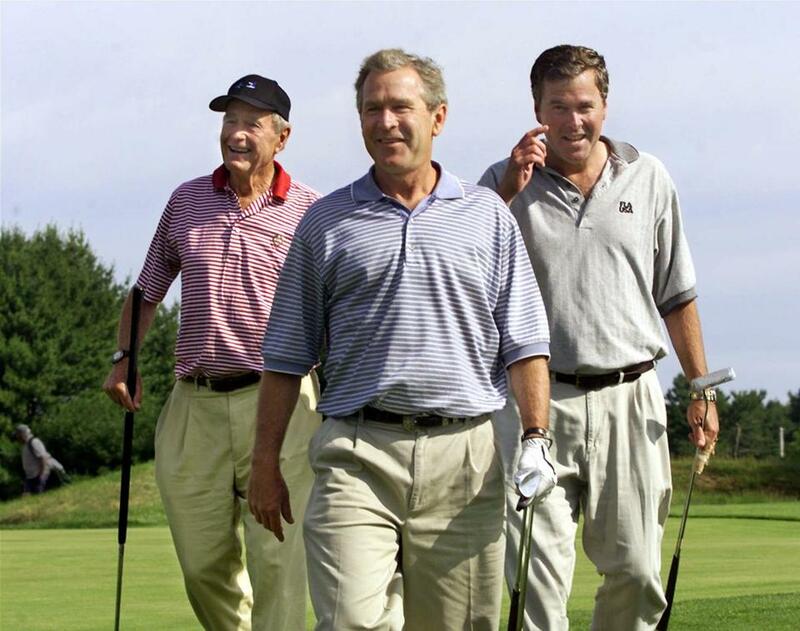 Bush, and Jeb Bush at the Cape Arundel Golf Club in Kennebunkport, Maine, in 2001. Some mornings, Bush drops into H.B. Provisions, a cozy general store owned by Bonnie Clement and her wife, Helen Thorgalsen (George H.W. Bush made international headlines when he attended their wedding in 2013; George W. Bush offered to perform the ceremony but had a scheduling conflict). Walker’s Point seemed to be enveloped last week in the anticipation of another summer. Birds chirped and couples strolled past the Bush compound, taking photos and sitting on nearby benches. A grounds crew mowed and watered the lawn ahead of the Memorial Day weekend. Outside Jeb Bush’s home, a yellow crane sat idle, and a ladder was left on top of the roof. Plans for the new house accelerated last year, according to interviews and a review of local property records. KW Architects started designing the home last spring, and a contractor began filing for permits in the fall. In December, the family partnership paid $1 to purchase the plot of land for Jeb Bush’s home from George H. Walker IV, a cousin who is a New York-based finance executive. The issue of personal wealth is bound to come up during the presidential campaign, particularly with candidates already talking about income disparities between rich and poor. Some Republican hopefuls have touted their own modest backgrounds and thrift; Bush aides, in turn, point out that Hillary Rodham Clinton owns multimillion-dollar homes in New York and Washington. Jeb Bush currently has one home, in Coral Gables, Fla., that he and his wife, Columba, purchased in 2011 for $1.3 million. The couple has three children and four grandchildren. The first floor of the Kennebunkport home holds the master bedroom, with bathroom and walk-in closet, while three more bedrooms, each with its own bathroom, are upstairs. Downstairs is a large open room that includes a kitchen, living room, dining room, and fireplace. 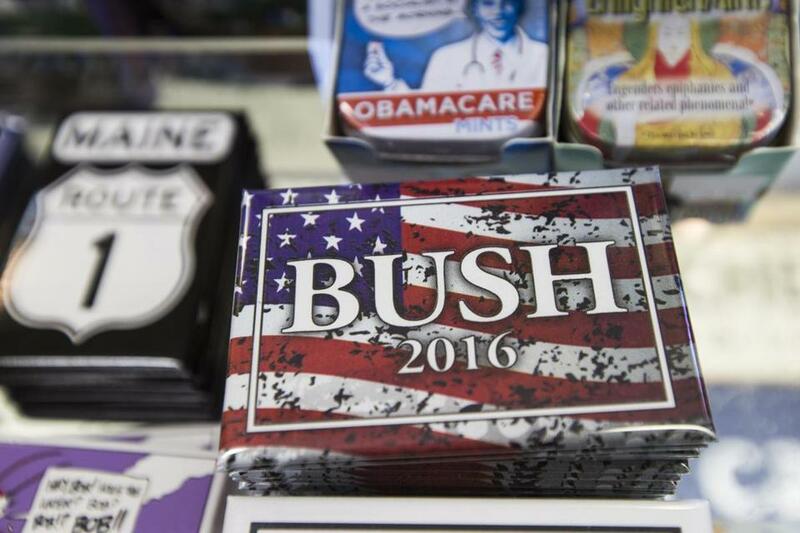 Magnets for a possible presidential campaign for Jeb Bush were on display in a Kennebunkport souvenir shop. The Bush family compound in Kennebunkport.